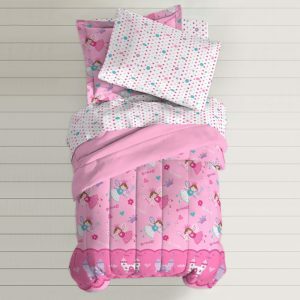 Dream Factory Magical Princess Ultra Soft Microfiber Girls Comforter Set, Pink, Twin is now available at Amazon.com for just $28.99(REG $49.99) (As of 13 February 2019, 13:05 PST – Details) with $21.00 (42%) Savings. 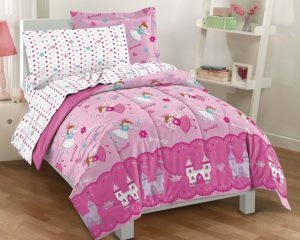 Your little girl will feel like a fairy princess with this Magical Princess complete bedroom ensemble! 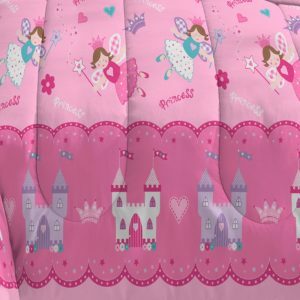 The ultra soft comforter and sham feature an allover design of castles, crowns, stylized flowers, hearts, magic wands and fairy princesses in shades of white, magenta, pink, blue and purple on a pink background, accented by the word “princess” in script letters. 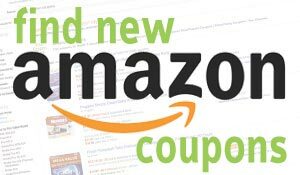 The comforter reverses to solid pink. A coordinating sheet set showcases a vertical pattern of hearts, crowns and flowers and is constructed of 100% polyester microfiber fabric.